The new service lets hotel advertisers monitor paid and organic listings while also checking for price parity compliance among re-sellers and online travel agencies (OTAs). 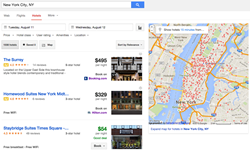 Hotel advertisers finally have a single tool to track hotel ads. The Search Monitor, the leader in precision ad intelligence for marketers and affiliate managers, today provided a sneak-peek of its upcoming hotel ad monitoring service which will monitor paid and organic listings on search engines, including hotel rates for price parity compliance. The new service will debut in August and monitor top travel markets globally. The automated technology will pull out key performance insights for hotel advertisers and online travel agencies, including hotel room rates, listing copy, share-of-voice, and average rank. Checking and comparing prices for the same property across operators and OTAs will be a key feature of the service. The service was designed to remedy the current way hotel advertisers monitor for price parity, which is often manual, time-consuming, and prone to errors. Further, online travel agencies often use different naming conventions and layouts in their ads, complicating the process of comparing ads. The Search Monitor encourages hotel advertisers to contact The Search Monitor and request a demo of how the new service will work when it launches next month.